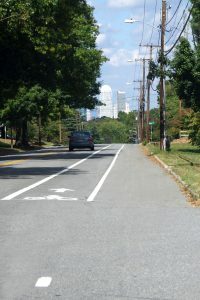 The City of Winston Salem selected DAVENPORT to determine the feasibility of adding bicycle lanes to the South Main Street Corridor. This is part of the City’s plan to make its facilities more multimodal. 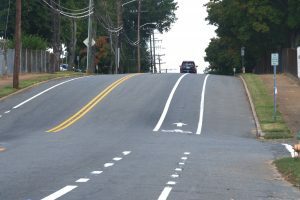 As a result of the feasibility study findings, DAVENPORT designed bike lanes for Main Street from Salem Avenue to Clemmonsville Road, and for Acadia Avenue (Salisbury Ridge Road) from Buchanan Street to Sunnyside Avenue. In lieu of adding an additional lane which would have cost significantly more, DAVENPORT modified the existing lanes to accommodate 5-wide bicycle lanes while maintaining traffic lane regulations. Where theavailable pavement was too narrow for a separate 5-wide bicycle lane, DAVENPORT established markings that indicated shared lanes. DAVENPORT also revised the existing signal design to accommodate the addition of bicycle lanes. This included both directions on Main Street and eliminating one of the two northbound left turn lanes. DAVENPORT also provided traffic signal design modifications to accommodate the dual direction bicycle lanes on Main Street at the intersection with Silas Creek Parkway. The designs met NCDOT standards and were review by WSDOT and NCDOT. DAVENPORT’s construction document package received minimal review comments. DAVENPORT completed professional services for this project in 2010, with the City of Winston-Salem implementing our design.